Below is an excerpt from the new book Full Funnel Marketing by Matt Heinz and his excellent Heinz Marketing team. This excerpt is a great example of the “full funnel” approach this book takes—encouraging B2B marketers to proactively address strategies and tactics throughout the sales process, not just the “top half” that marketing has traditionally owned. If you like what you read, you can get a free complete copy of the book here. As the function and importance of content marketing increases for B2B companies, organization of that effort has picked up speed as well. Many companies are developing entire, internal “newsrooms” that effectively mimic the organization, cadence, and efficiency of professional journalism environments. But today’s B2B content marketing needs so much more than that. It happens faster, and requires far more work post-publication to maximize impact, conversion, and shelf-life. 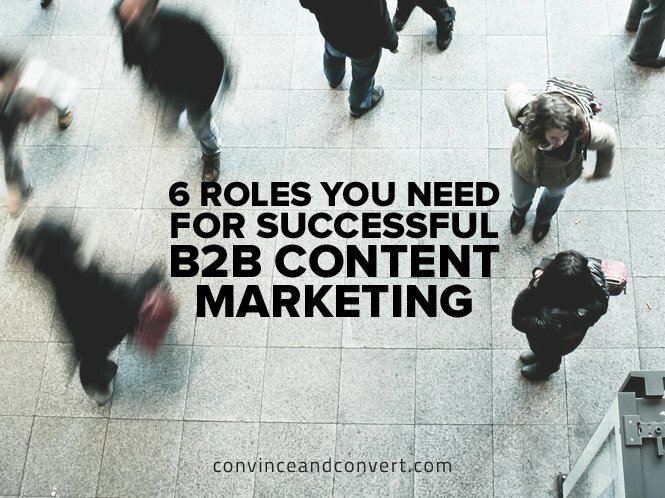 To be successful in content marketing, you need at minimum six roles. These roles don’t need to be owned by five distinct people. In some cases, one person may own multiple roles. In other cases, roles might be managed by multiple people. But no matter how you organize and execute, make sure these functions are understood and filled. It’s near impossible to create an effective content marketing program without injecting every level of effort with your customer’s point of view. This includes up-front input into your editorial calendar, an understanding of what formats and channels your target customers prefer, and real-time feedback on published content, as well as reactive content production and participation opportunities. This role can be filled by a network of customers directly, by regular input from your customer-facing employees, or by a liaison in marketing (perhaps your product planners, research directors, or otherwise) who provides feedback, reaction, and input early and often. Someone needs to develop, manage, and optimize the content program overall. What are our objectives? How are we measuring immediate results and long-term success? How do our efforts tie into the broader business goals, and how do we integrate our work into that of the rest of marketing, sales, customer service, account management, etc.? This role develops the up-front plan and ensures alignment against goals moving forward. This role translates the customer insight and objectives into an editorial calendar that directs premeditated, near-term content development and accounts for immediate, real-time reactive content opportunities. This role manages the overall editorial tone, output, and direction of the content. It’s a hybrid role, really, strategic and tactical but focused on delivering results and output that realize the objectives and vision of the Strategist. What’s due when? What is the production, review, and publication process? What happens when? This is a purely and critically important operational role to ensure everything is done on time, published on time, and executed as efficiently as possible. Simply put, this role creates the content. Even with a small content marketing effort, this role is typically played by multiple contributors—writers, videographers, designers, etc. You know what they say about the tree falling in a forest with nobody around. This role is all about traffic. Eyeballs. Both immediate and ongoing. Too often, companies publish something and drive traffic that day, then move onto the next piece of content without cycling through older but still relevant content on a regular basis. Amplifiers are responsible for increasing the initial “bump” of traffic for new content but continuing to expand the long-term shelf life and impact of the entire library. We’re curious if these roles match how your organization is executing. What roles are you missing? What critical roles am I missing in this outline? Get a free, complete copy of Full Funnel Marketing here.